We will be reusing the Poetry example from the blog's examples repo as a base for this article. Any required changes wil be detailed. Poetry uses configuration files to store custom indexes' credentials, so most of our work will be done using poetry config and some changes to our pyproject.toml file. First, let's add a reference to our repository in the pyproject.toml file (above the tool.poetry.dependencies section), add the section below to your file and make sure to replace the values to fit your setup. Then, configure the credentials for your repo. Note that this only needs to be done once per repo, not per project. $ poetry config http-basic.my-custom-repo user1 secretp4ssword! Poetry should find and install your package and update your pyproject.toml file with this new dependency. You can add as many package indexes as you need without issue. Now, chances are that if you have an internal package index you most likely will need a way to publish those packages. 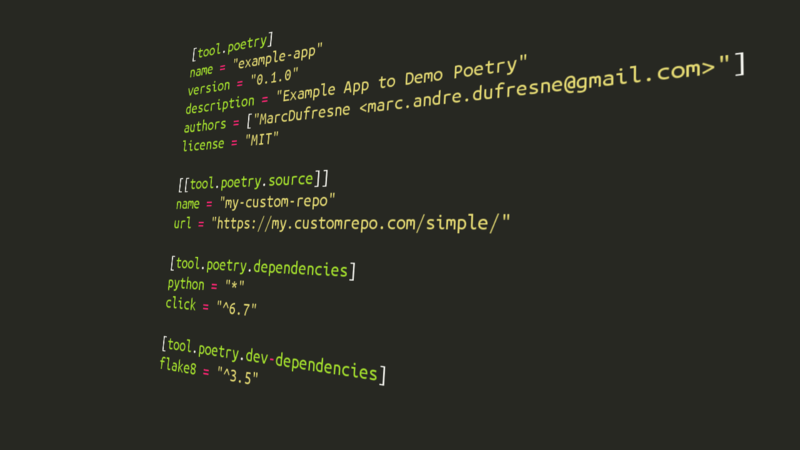 Since Poetry does away with the setup.py file you need a new way to build and publish your custom packages, enter poetry build and poetry publish. The build command speaks for itself, when invoked it will build a source and a wheel release of your project in the dist directory. This will take whatever is in the dist directory and upload it to your custom index (specified using -r). You can skip the build command by adding the --build option to your publish command. This will build and publish at the same time. PRO TIP: You can also use the poetry version command to automatically change your project's version number! That's it! You are done with installing and publishing private packages, for more information consult the official Poetry documentation.